Vietnam’s top badminton player Nguyen Tien Minh has jumped two places from 13th place to 11th in the world rankings, according to the latest figures from the Badminton World Federation (BWF). 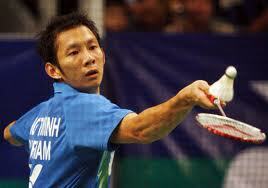 Olympian Minh's promotion came as a result of his triumph in the recent Yonex Chinese Taipei Open Grand Prix Gold. The HCM City-born player now has 54,634 points. The world No.1 spot belongs to Lee Chong Wei of Malaysia , followed by Chinese players Lin Dan and Chen Long. The next BWF rankings will be announced on October 18.